The Amazing Resilience of Weeds: A Review of Richard Mabey’s "Weeds: In Defense of Nature’s Most Unloved Plants"
Weeds suffer in our estimation not only from their annoying invasiveness but also from the dismal places in which they live, namely among urban blight, environmental devastation, and trash dumps. In doing so weeds acquire the disrepute that more properly belongs to the slovenly people who debase the properties where they reside, what Mabey terms “guilt by association.” For example, In hardboiled detective stories, where cases often lead to badly maintained houses in sketchy neighborhoods, weeds abound alongside torn window screens, peeling paint, yellowed newspapers, litter, and rings of motor oil on the cracked driveways. Weeds are synonymous with neglect. It has long been said that the only survivors of nuclear war will be cockroaches and Keith Richards. I put my money on weeds. This is not to say that Mr. Mabey is entirely sold on the weed community by virtue of its ubiquity and determination to survive. For one thing, he notes the ugliness of many of its members. 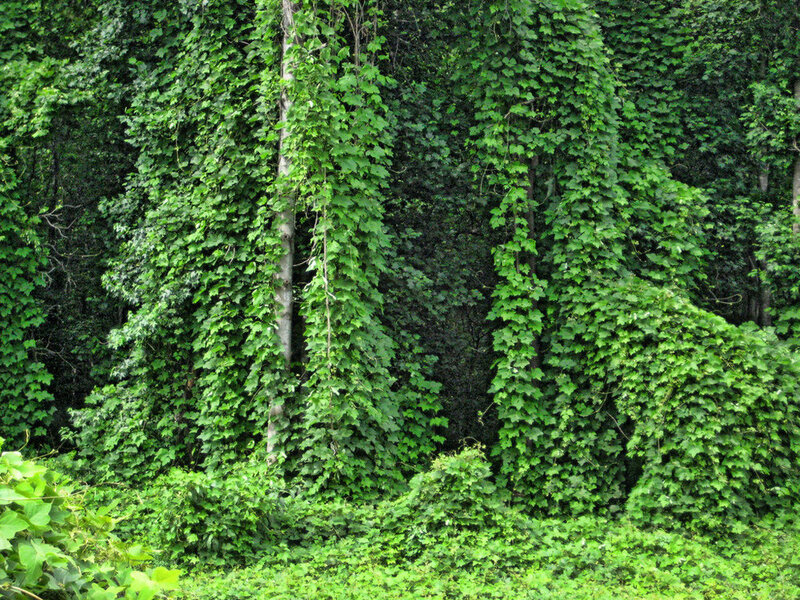 More serious is the rampant growth of superweeds such as kudzu, that are glyphosate-resistant, i.e., Roundup-tolerant. Superweeds spread from continent to continent and are frightening in not only their destructiveness and refusal to be controlled, but in some cases, their grotesque size. Horseweed grows to six feet high, and the Palmer amaranth reaches eight feet while developing a stem so tough it can damage farm machinery. Sound like a monster movie? In a desperate effort to halt the invasion of superweeds, newer herbicides have been developed, some of which even use components of the notorious Agent Orange. Our City Forest uses nontoxic measures to control weeds. Over the years Volunteers and AmeriCorps members have been a great help in hand weeding OCF’s Community Nursery and Martial Cottle acreage. In addition, weed cloths and mulch-covered cardboard are used at both sites. A recent blog related how OCF’s Lawn Busters effectively use cardboard and mulch in converting weed-ridden lawns to drought-resistant, weed-free xeriscapes. So how did weeds acquire their tenacity? Why do they survive in places that are alien to the rest of the botanical world? One reason, according to Mabey, is they originated in places of continual disturbance where adapting to such conditions was necessary for survival. Weeds, he writes, “evolved on tide-pounded beaches and the precarious slopes of volcanoes, in the flood zones at the edges of rivers and the muddy wallows made by wild grazing animals, in scree and shingle and glacial moraines.” No wonder weeds are tough cookies. Plants that live in such turbulent and unstable conditions must develop special characteristics to survive. As a consequence of their background, many weeds germinate quickly and have expedited life cycles. They jump at brief windows of life while spreading prodigious numbers of seeds. Some seeds have barbs that catch on to passing animals and spread wherever the animal travels. Other seeds lie dormant for remarkably long periods of time and eventually germinate when conditions are right. For example, species not seen for decades sprouted in the rubble created by German bombing of London in World War II. Even more remarkable are recent archaeological digs in the UK at ancient Roman sites that prompt dormant seeds to sprout that are up to 2,000 years old! If a seed company marketed packets of weed seeds (an unthinkable idea), how would the “use by dates” read? Best if used by December, 2077? July, 4017? This charming and informative--and occasionally frightening--book goes beyond weeds’ ability to propagate and endure. For instance, Mr. Mabey, in what he calls the “human story of weeds,” considers man’s long and troubled relationship with weeds. Some species possess, or were once believed to possess, special medicinal properties. Hence they go in and out of fashion. Use of herbicides actually end up benefiting weeds by increasing their tolerance to them. Spraying tons of Agent Orange on rainforests in Viet Nam killed the trees but allowed a tough grass called cogon to flourish in their place. Once checked by the forest’s shady canopy, cogon now thrives in Viet Nam’s defoliated landscapes..
Field infested with Palmer amaranth. In spite of their astonishing resilience and contributions to the health of the planet, such as retaining topsoil (see Mark Schonberg’s article, “An Ecological Understanding of Weeds” for other benefits provided by weeds), weeds remain a tough sell. Think mosquitoes and viruses. The fact that something is adaptable and tenacious does not make it endearing. Flowers and shrubs, on the other hand, may be wimpy in comparison to weeds, but they are far easier to love.